Estonia – Close to 25% of the world’s power production capacity depends on our customer’s technology and services. Specialising in electrical generation and transmission, with products including turbines for hydroelectric, gas, coal and nuclearpowered plants, their clean technologies generate electricity equivalent to the needs of around 1.2 billion homes. In Narva, Estonia, our customer is building a Combine Cycle Turbine to supply electricity for homes. 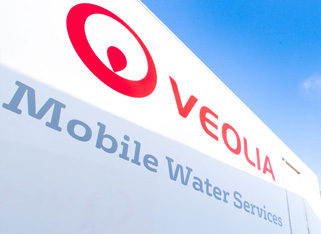 Veolia’s Mobile Water Services received a request from a customer to commission a mobile unit to clean the new boiler of a recently developed oil shalefired power plant. As the current deionised water system was not producing enough water, the customer required a temporary water source. Process Capacity: a continuous supply of 75 m3 /h of <5µS/cm demineralized water. Quality: Adherence to local market regulations ensures stringent process control by Veolia. Service: a continuous supply during the 10 day project, 16 hours per day with our engineers onsite throughout this period. To Budget: Project finished within customer’s budget.